Here is "TOP" No. 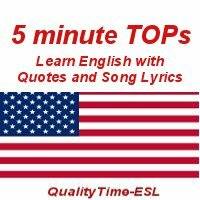 17 to help you understand spoken English through "Training with Oral Practice" based on quotes and song lyrics. Click on the icon below to get the recording or go to the iTunes store to subscribe and just type "Marianne Raynaud" in the search window. For the transcript: Go to the store where you will find a pack of transcripts for the TOPs for a minimal price. If you want to go on, TOP 18 is coming soon. You can also work on our previous TOP episodes. Write us with your comments if you are progressing with our three series of podcasts. If you want to know what song(s) we referred to, here are links to great videos. Enjoy! And practice!